Discover the difference 40 years of experience makes. We specialize in modern lock technology. When you need lock and key services, turn to the professionals with more than 40 years of experience: AA Affordable Locksmith. We serve residential and commercial customers throughout Payson and Fountain Hills, AZ, providing complete services ranging from simple lockouts and key duplication, to safe repairs and electronic lock installations. Contact us in your time of need for reliable, friendly service that makes you feel safer and more secure. 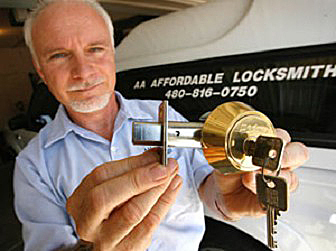 Customers throughout the region have been turning to us for reliable locksmith services for more than 20 years! When it comes to lock and key, there’s so much we can do! From key duplication to electronic locks, our capabilities are tailored around your needs. Our experience with safes is unmatched. We can install and service all types of safes, including floor, gun, fire, data and wall safes, as well as cash drop safes and more. We also provide automotive lockout services in a pinch. We’ll get your doors open fast, so you can get back on your way. We rely on our locks and keys to keep us safe and protected. Unfortunately, sometimes they do their job too well! Lost keys and damaged locks can leave us standing on the wrong side of the door with no way in. If you run into this situation, the best thing you can do is call a reliable locksmith near Payson and Fountain Hills, AZ. AA Affordable Locksmith will answer the call and make sure your door is unlocked, with you back on the right side of it as soon as possible. And, we’ll stick around to fix whatever problem led to your lockout in the first place. Count on us to cut keys, repair damaged locks, replace failing locks and more. The best part is, because we’re a mobile locksmith serving Payson and Fountain Hills, AZ, we can get to your location fast when you call! More than just answering the call for lockouts, customers also rely on us for all of their other lock and key needs. We help residential customers with things like master keying and lock re-keying, to maximize the convenience of their existing locks. Commercial customers call us for storefront security and panic button installation, among other needs. We’re also the authority on safes, providing combination changes, safe unlocking, repairs, installations and much more! Locked out of your car? We even offer auto lockout service near Payson and Fountain Hills, AZ to get you back into your vehicle. With more than 40 years of experience behind us, there’s not much we can’t do when it comes to your locks, keys and safes! Give us a call today and let us put that experience to work for you. From a simple lockout to a combination change for your safe, count on AA Affordable Locksmith. We bring more than 40 years of expertise to every jobsite. Contact us today! Proudly Providing Locksmith Services to the following areas.